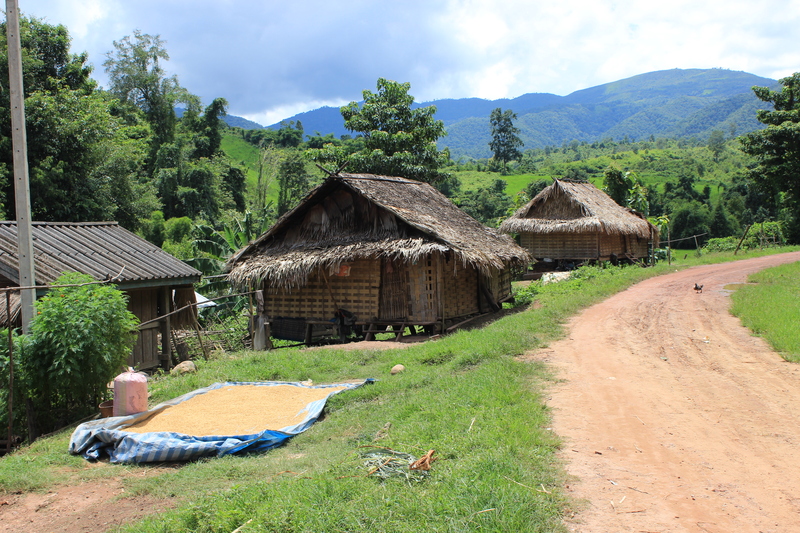 One day in northern Laos, I decided to take a secondary road (one not shown on Google Maps, as I noticed later) from a small city called Hongsa back to the very popular city of Luang Prabang. 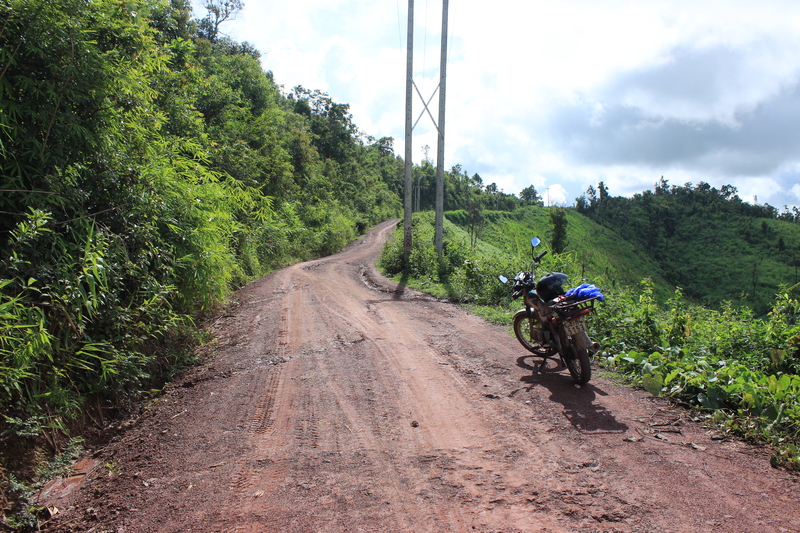 It ended up being the longest, craziest, most intense motorcycle drive I’ve had yet (thankfully it was just an overnight trip, so I had only my small backpack with my large one back in Luang Prabang). The memorable start to the story is that, on my drive from Luang Prabang to Hongsa the day before, as it eventually started to rain heavily towards the end, I pulled off the road during a downpour next to a Laos couple and we started talking. Almost immediately, after asking where I was from and what my name was, the man, Bun Ma, invited me to see his village, so I followed him through the treacherous weather to his home in Ban Champa, near the city of Hongsa (my intended destination). He had just been married in Luang Prabang and owns a motorbike repair shop near his home. He used to be a monk in Luang Prabang and spoke good English. When he asked me if I wanted to stay in his home for the night, I thought, “Why not?” It was a wonderful, humbling experience. The next day, after saying thank you and goodbye to my gracious hosts, I left shortly after 8:00am from Hongsa, and didn’t arrive back in Luang Prabang until about 4:00pm — and it was only 126 km. I set off to go back via a different route, which I thought would be similar to the route I took the day before. Boy, was I wrong. The day before I had failed to notice (due to the heavy rain) that the road I planned on taking was a dirt one (in monsoon season, mud as much as dirt). That morning when I arrived at the road, I most definitely noticed, and almost bailed out to go back the same way I initially came the day before. I asked some local guys if the road was fine and they managed to explain through hand gestures and broken English that it was supposed to be okay. I wasn’t so sure, and was very hesitant to attempt it. Eventually, after some indecision, I thought I’d at least check it out and see what the situation was. So, once I began, and kept going, there was eventually no turning back. At one point near the beginning of the ride I had to push my bike the rest of the way up a hill since the mud was so slick. I almost turned around, but again at the bottom of the hill some men managed to convey that the road was “sabai” – okay – to Luang Prabang. So, against my better judgment, I kept going. The road was the worst and scariest I’ve driven, increased by the fact that high up in the mountains and it could have started raining at any moment, which would have literally made the trip impossible, making the hardened mud as slick as ice. The road was steep, up and down, with countless turns, consisting of fully dirt, mud and stone, at some places very slick with a never ending amount of ditches and potholes and ruts (thanks to the rain and wear and tear). I had moments of sliding sideways, driving through deep pits of mud and muddy water, and crawled at a snail-like pace. I prayed constantly – “no rain in Jesus’ name…good weather…rain hold off in Jesus’ name…God thank you for safety…” It definitely increased my prayer life and faith level that day. Initially, when unsure if I should go for it, I told myself – “Why listen to fear, why bail out if I’m unsure where the road leads as is my tendency, why not just go for it?” I knew the chances were that it could rain, I could get stuck, I could have an accident, the bike could break down… any one of those outcomes were legitimate concerns. And boy was it indeed treacherous – a road meant more for a dirt bike or four wheeler or 4×4 rather than an old 100cc Honda Win. I bumped and wound and crawled my way, slow km by slow km. At times I wondered what the heck I was doing. I just kept praying, hoping I would make it safely. My poor bike took a beating, but she held up. There was every sort of creak and rattle and noise imaginable to the ears. The first 1/2 to 1/3 of the journey was the worst, as I was high in the mountains and there was no straight run to bring relief. 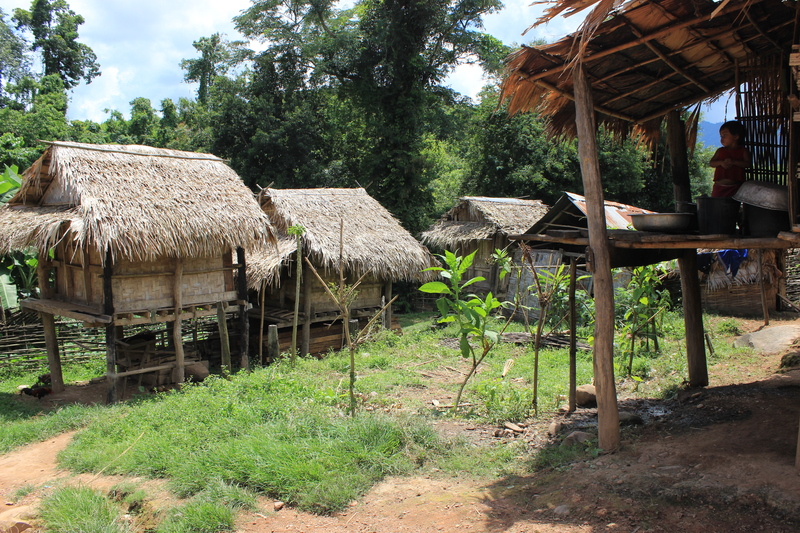 I passed communities that were too small to call villages, with a few bamboo and straw houses clustered together. I was given one curious stare after the other by locals riding and walking, probably thinking, “What in the world is this foreigner doing driving on this road?” I was thinking the same thing at certain moments. I made a few stops for pictures along the way because the scenery and villages were just too pure to not take a few photos. 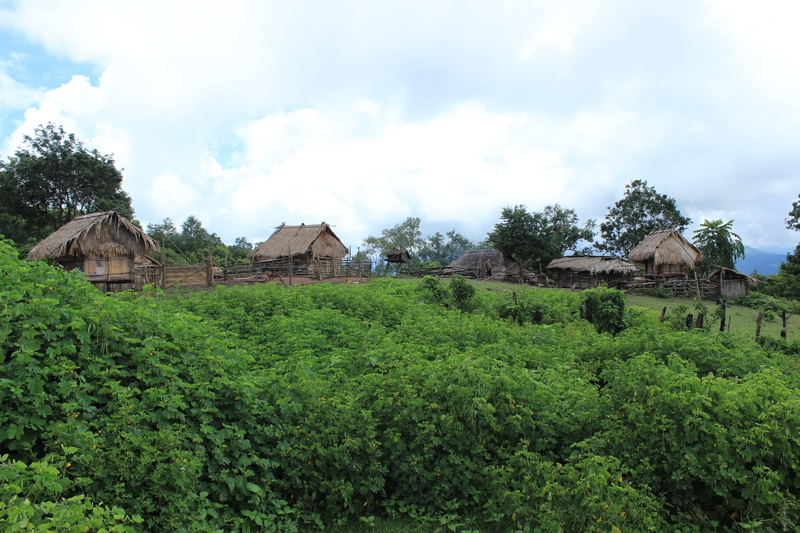 I was high in the green, lush mountains of northern Laos, and they extended as far as I could see. Many kids waved and said hello, while the adults (and definitely a few kids too) simply had blank expressions while their heads followed me as I passed. Near the end I walked my bike (and drove once or twice) through some 4 or 5 streams created by the rains, some almost knee deep. My bike always started back up. I was so on edge and focused, the time just passed by, though I barely made progress. I was riding a lot in 2nd gear, a little in 3rd, some in 1st, and barely any 4th the whole trip. At some steep slopes I was just barely making it up at full throttle in 1st gear. Down most hills, I was crawling in 2nd while hard on the break that barely worked, and sometimes even in 1st, with my balding back tire sliding around at times. Thankfully, I noticed the road started to level out towards the last section, and I was relieved. During the initial drive and the worst sections of road, clouds constantly gathered and dispersed, some dark and looking like they might bring rain. But they never did. And towards the end the sun shone bright and the clouds were few. I was relieved to say the least. But with better roads there was a constant rumbling and jolting against the stones that stuck above the dirt/mud surface, meaning it was a rough ride with very few smooth sections. On top of that loose stone chips covered the surface, to add an extra hazard. Near the end I stopped to have a break, buying a liter of fuel and a snack, and trying to talk to some locals and children. During the drive, men were carrying chopped off bamboo, children were playing and riding bike, youth were riding motorbikes, all ages sat around in the shade, women were walking with knives and sacks carried by their heads, rice and corn were lying out on tarps to dry. Mountains rose and fell, valleys laid stretched out below, clouds gathered and disbanded. The amazing scenery, the adventure and thrill, the people and small villages I passed, being out in the middle of absolutely nowhere on a God-forsaken road, these made it all worth it. Without risk, you can’t discover adventure. If I would have turned back, I would have the missed the opportunity to see what I did, meet who I did, and conquer a formidable road, not succumbing to the voice of fear. It was rough (in every sense of the word), but worth it; and with it a lot of memories. I can think back to the time, “Gosh, remember when I drove that road of insanity in northern Laos, winding through the mountains in the middle of nowhere, on a little, old Honda Win 100cc?” What a few days of randomly meeting a local couple, staying at their home for the night, and taking my craziest bike trip yet through the mountains of northern Laos on a road that has no business being called a road. But it payed off. It’s much like life. We can always find a thousand and one reasons to not do something, considering all the risks and all that could go wrong, resulting in failure. It’s not about being brash or proving oneself; it’s not about brushing off common sense or healthy caution; it’s not about pride or selfishness. It’s about taking risks for ourselves and the benefit of others, to overcome the voices of fear. Before leaving for Asia, my father told me, “Say no to fear and intimidation. Fear is your enemy and needs to be treated as one. You have to face it, and fight it.” In this instance, I could have taken the “easy road”, the predictable one, knowing exactly where it would take me, and knowing it would be safe. But I would have missed the treasures that accompany the unknown road, the path less traveled. 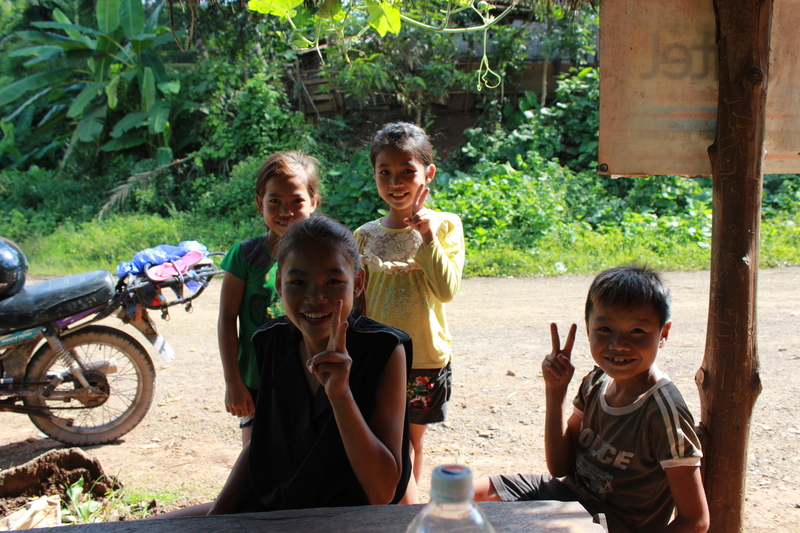 And that is what I learned from a day on my motorbike in northern Laos. It’s really not about the drive, the motorbike, the road; what was nerve-racking for me may be part of a daily drive for any local and a piece of cake for someone with a better bike or lots of experience. It doesn’t really matter that what we fear, others may not fear, and that what they fear, we may not fear. It’s about our personal responses to our personal fears, no matter how small or big, and the risks we must take in spite of them, or maybe even because of them. For fear is a thief, and may be strongest where we have the most to gain. As my father said, “You have to face it, and fight it.” No one can do that for us. My hosts for the night. 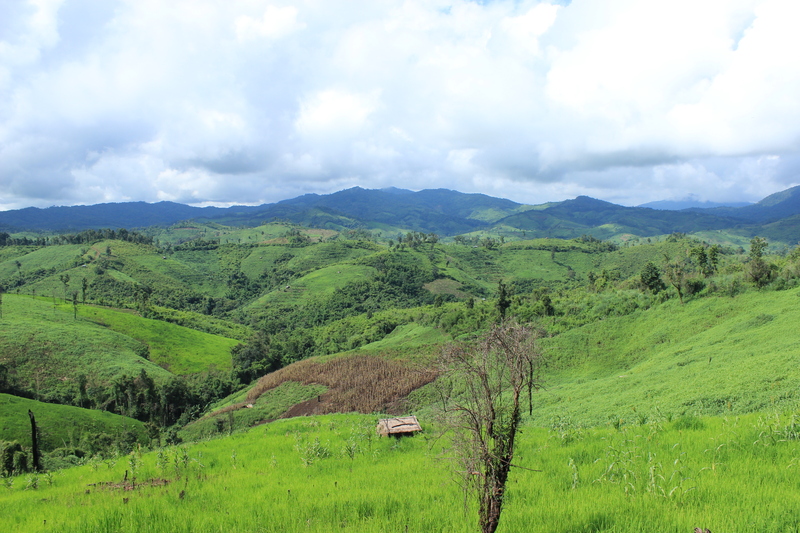 The green, lush, mountainous scenery of northern Laos. The road (I wish I had photos of the bad spots). Small communities in the mountains.